Ample onsite parking with additional parking located across the street and 2 blocks down in public parking structure. DJ's Friday Night Happy Hour, Live Entertainment Sunday Evenings 5p to 8p with all Night Happy Hour and half priced entrees at the bar and on the patio. Buddha Lounge Saturday Nights with Live Entertainment from 5p to 8p. Reservation Confirmation Message: Thank you for making your reservation online. We look forward to seeing you. Please contact us at 760-325-9264 with any questions. Delivery by Postmates.com only $3.99 for Wang's in the Desert orders to anywhere in the valley. First time Postmates users can use the code: wang's to receive their first delivery free. found throughout Asia and the Pacific. 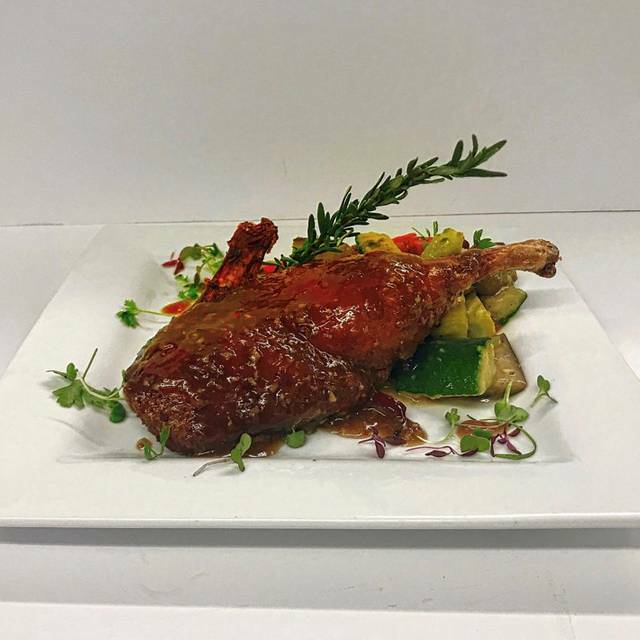 Whether dining or relaxing, Wang’s represents California living at its very best. At Wang's in the Desert we use only the finest and freshest ingredients. Our dinner service is family style and is meant to be shared. This ensures that everyone at your table has the chance to enjoy everything our menu has to offer. All selections are brought to your table the minute they are prepared. Special Gluten-free and Vegetarian Menus available upon request. A $2 per person Cake Serving Fee and a $20 Corkage Fee for Guests who like to bring their own Bottle of Wine. Steamed White Rice Served with Entrees - Brown Rice Available on Request for $3, Side White Rice with Appetizers $3. Thai spicy shrimp soup with kefir leaves, lemongrass, straw mushrooms, and white mushrooms. Water Chestnuts, Peas and Carrots. Thai spicy chicken soup with kefir leaves, lemongrass, straw mushrooms and white mushrooms. Tofu, Egg, Wood Ear Mushrooms and Bamboo Strips. Chicken and Shrimp Cabbage Rolls - Pork Dumplings - Chicken Pot Stickers. Half Spring Rolls, Mini Beef Skewers, Cream Cheese Wontons. Sweet Soy Vinaigrette Dipping Sauce. Sliced Angus Beef Marinated in Our Traditional House-made BBQ, Soy Sauce. Deep-fried Wontons Filled with Cream Cheese, Crab and Seasonings. Served with a Sweet Soy Dipping Sauce. Tofu Strips Wok-Fried, then Tossed in Salt and Pepper. Served with a Spicy Dipping Soy Sauce Vinaigrette. Chinese Soy Beans, Wokked in a Garlic, Soy Sauce. Seared Ahi Rolled in Black and White Seeds. Served with a Ponzu Sauce. Cold Noodles Tossed in our House-made Peanut Sauce. Filled with Cream Cheese and Served with a Sweet Soy Dipping Sauce. Large Shrimp Tossed in Sweet Coconut, Deep-fried Golden Brown, Served with a Sweet Asian Aioli Sauce. Bite-Sized Pork Ribs Braised in a Soy BBQ Sauce, Served on our Tangy Korean Cole Slaw. Deep Fried and Filled with Fresh Vegetables. Chilled Chinese Soy Beans Tossed in Sea Salt. 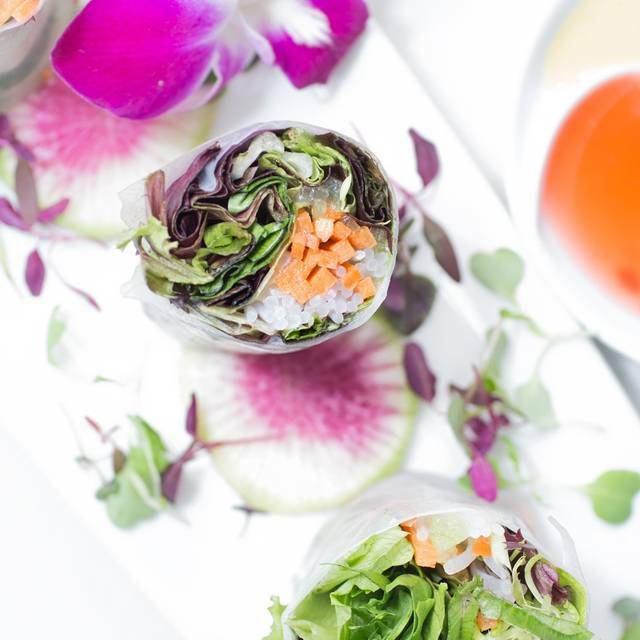 Fresh Raw Vegetables Wrapped in Rice Paper with a Citrus Vinaigrette Side. Calamari Steak Medallions, Seasoned with Garlic, Jalapenos, Scallions, Lemon Juice, Salt and Pepper. 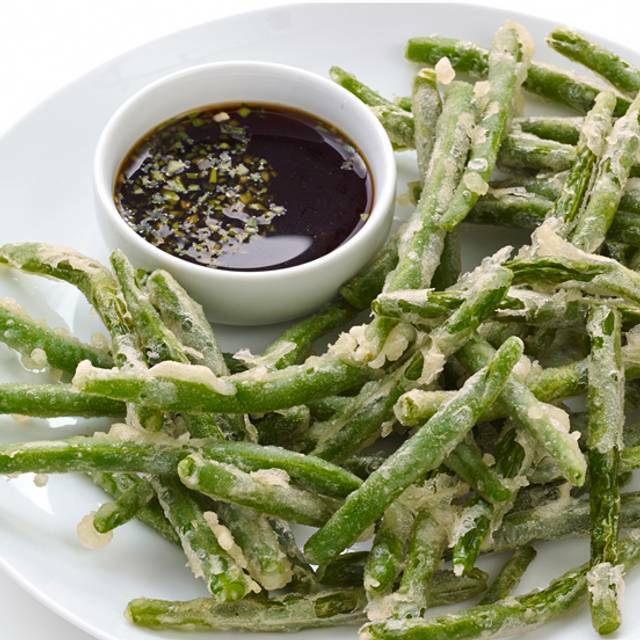 Tempura fried green beans with sweet ginger soy. Breaded in Japanese Panko Bread Crumbs with Ginger White Wine, Lemon Blanc and Capers. 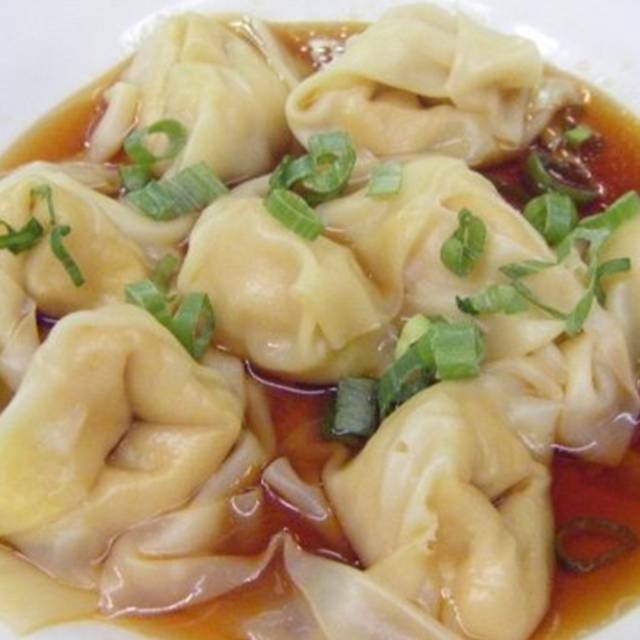 Steamed Chicken Wontons Served in a Spicy Vinaigrette Oil with Chives. Served with Wasabi, Ginger, Crispy Wonton Strips. Mixed Green and Red Cabbage with Sauteed Soy, Ginger Chicken, Garnished with Wonton Crisps, Mandarin Orange Segments and Cashews. Minced Chicken Breast, Mint Leaves, Coriander Leaves, Lemongrass, Minced Thai Chili, Rice Powder, Red Onions and Lime. Snow Peas, Bean Sprouts, Carrots, Peppers, Cilantro Leaves, Mint, Green Onions, Peanuts and Marinated Asian Seasoned Chicken. Mesclun Greens with a Raspberry Ginger Vinaigrette, Drizzled with a Balsamic Reduction and Garnished with Fresh Raspberries. Crispy Chicken Breast, Mixed Green Lettuce in a Peanut Dressing. Julienne Carrots, Julienne Red Peppers, Celery Micro Herbs and Sesame Vinaigrette. Mixed Greens and Cucumbers Tossed with a Gluten-free Soy, Rice Vinegar, Sesame Oil Vinaigrette. Mixed Greens Tossed with a Sesame Ginger Dressing. Marinated Flank Steak with Rice Noodles, Onions, Scallions and Bean Sprouts Wokked in a Sweet Soy / Oyster Sauce. A Traditional Stir-Fry Dish in Laos and Thailand. Wild Rice Noodles with Mixed Bell Peppers, Asparagus, Onions, Mushrooms, and Thai Basil. Stir-fried in a Spicy Oyster Sauce. 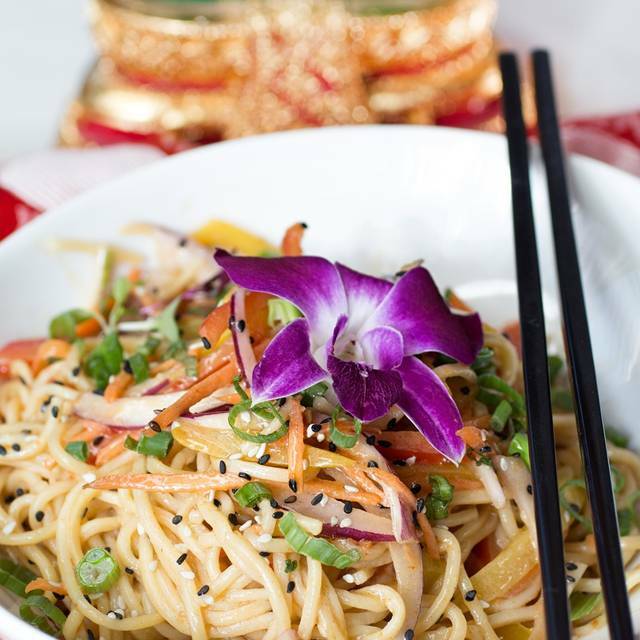 Chinese Noodles Wokked with Julienned Vegetables in a Classic Soy, Garlic Brown Sauce. Chicken Breast, Rice Noodles, Scallions, Bean Sprouts and Chopped Peanuts, Coriander and Lime in a Pad Thai Sauce. Chinese Noodles Topped with Cabbage, Scallions, Celery and Bean Sprouts. Wokked in a Chicken Stock White Sauce. Chicken Breast, Yellow Curry, Sesame Oil, Ginger, Sherry Wine, Red and Yellow Peppers, Scallions, Bean Sprouts, BBQ Sauce, Soy Sauce and Oyster Sauce. Fresh Orange Peels, Garlic and Ginger in a mild spicy honey sweet sauce. Tempura-fried Tofu, Asparagus, Bok Choy, Green Beans, White Mushrooms, with Spicy Aioli and Sweet Ginger Soy. Tofu Lightly Marinated in Minced Ginger, Garlic, Fresno Peppers and Sesame Oil. Wokked with Button Mushrooms and Spinach. Deep-fried Tofu with Roasted Peanuts, Sweet Peppers, Dried Chilies and Onions. Wokked in a Caramelized Soy Sauce. with Spiced Brown Tofu in a Garlic Sauce. Mixed Vegetables in a Mushroom Sauce. Wokked in fresh garlic and soy oyster sauce. With Mushroom Sauce and Button Mushrooms. Chicken Breast Sliced and Battered, White Onions, Broccoli and Walnuts in a Wang's Spiced Sauce. Sliced Fried Chicken Breast, Topped with a Sweet Fresh Lemon Sauce. In a Spicy Thai Peanut Sweet and Sour Pineapple Sauce. Sesame and Panko Crusted Deep-fried Chicken Breast, Served with a Pineapple, Sweet and Sour Sauce. Pork Loin Wokked in a Sweet and Sour Honey Sauce with Garlic, Ginger, Sweet Sambal and Green Scallions. Lightly Battered and Fried Tiger Prawns Wokked in a Lemon Sour Sauce. Served on Baby Bok Choy. 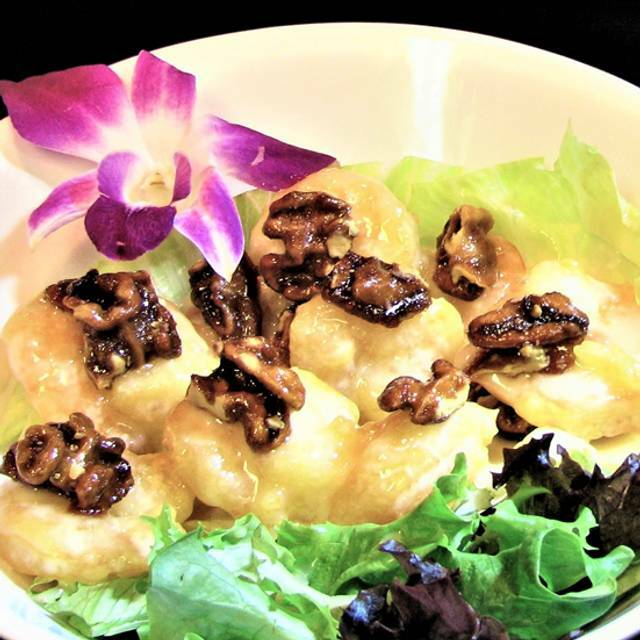 Battered Shrimp, Quick-fried and Tossed in a Cream Mayonnaise Honey Mustard Sauce with Candied Walnuts. Served with a Side of Chinese Cabbage and Straw Mushrooms in a Garlic Sauce. Fresh Orange Peels, Garlic and Ginger in a Mildly Spicy, Honey Sweet Sauce. Lightly Battered and Wok-fried in a Tangy Sweet and Sour Sauce with Assorted Bell Peppers, Onions and Pineapple. Chicken Breast, Beef, Scallops, Shrimp and Mixed Vegetables Wokked in an Oyster / Soy Sauce. Recommended to be Shared with 2 or More. Sliced Angus Beef Wokked in a Spicy Sauce, alongside Tiger Shrimp in a Mild Sauce. Crispy Chicken, Ginger, Garlic, Hot Pepper and Honey Sauce. Sweet Shrimp with Ginger, Garlic and a Sweet Tomato Sauce. Chicken Breast and Shrimp Wokked in a Garlic Black Bean BBQ Sauce, Garnished with Baby Bok Choy. Snow Peas, Water Chestnuts, Scallions, Ginger and Garlic Wokked in a Traditional Chinese Chicken Stock. Chicken Breast, Flank Steak with Celery Red Pepper with Szechuan Sauce. Sliced Flank Steak with Sweet White Onions and Scallions in a Mongolian Sauce. Dark Meat Chicken with Water Chestnuts, Button Mushrooms, and Garlic in a Sightly Sweet Brown Sauce. Minced Chicken Breast, Water Chestnuts, Pine Nuts with a Plum Vinaigrette. Basa, a Mild White Fish, Sauteed with Cajun Spices, Fingerling Potatoes and Spinach, Served with a Sake Beurre Blanc. Tempura-fried Shrimp, Asparagus, Bok Choy, Green Beans, Eggplant with Spicy Aioli and Sweet Ginger Soy. Pan-seared 8 oz. Rib Eye Steak, Seasoned with Soy, Ginger, Garlic and Sesame Oil. Served with Kimchee and Bok Choy. Snow Peas Julienned Carrots and Celery in a Tangy, Garlic Sauce. Sliced Flank Steak Stir-Fry in Broccoli. Served in a Savory Beef and Oyster Sauce. Salmon, Baby Bok Choy, Shiitake Mushrooms in a Citrus Ponzu Sauce. Sliced Pork and Aged Tofu Wokked in a Spicy Hoisin Soy Sauce with Minced Garlic, Red Bell Peppers and Cabbage. Yellow Curry Sauce with Sweet White Onions, Carrots and Peas. Stir-Fry with Roasted Peanuts, Sweet Bell Peppers, White Onions, Dried Chilies and Caramelized Soy Sauce. Crispy Chicken Thighs in an Orange Reduction Sauce with a touch of Teriyaki Sauce. Bell Pepper, Lemongrass, Straw Mushrooms, Carrots, Bamboo, Basil and Red Curry Sauce. Sliced Angus Beef, Celery, Green Onions, Carrots Wokked in a Szechuan Sauce. 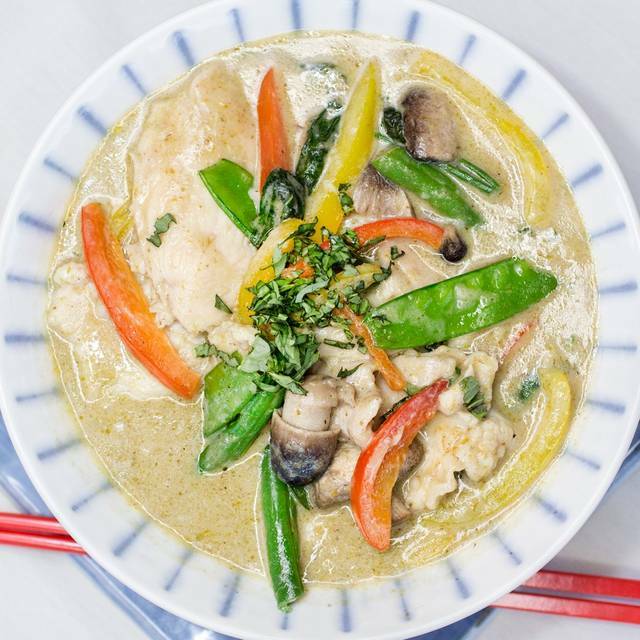 Mushrooms, Snow Peas, Straw Mushrooms in a Green Curry Sauce. Jalapenos, Onions, Salt and Pepper Seasonings, Wokked in an Asian BBQ Glaze. Angus Flank Steak Marinated in a Sesame Ginger Sauce, Served with Leeks and Asparagus with Salt, Pepper and Garlic. Sliced Angus with Mixed Vegetables in a Spicy Oyster Soy Sauce. 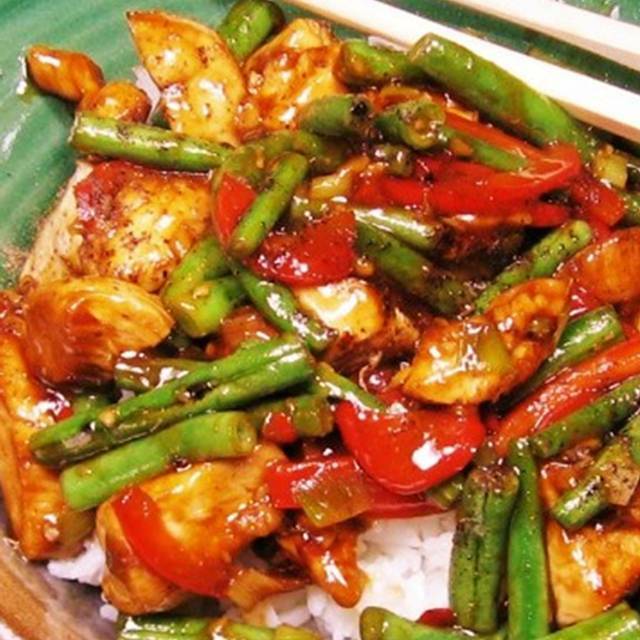 Chicken Breast, Green Beans, Mix Bell Peppers Ginger and Soy Oyster Sauce. Chicken Breast, Mixed Bell Peppers, Coriander Leaves Scallions, Panang Curry with a Touch of Peanut Butter. White Rice, Wok-fried with Soy Sauce, Egg, Scallions, Peas and Carrots. Nice atmosphere and good service, but the food is overpriced by 25% above the going rate for good Chinese food. We were on time but was told our table was given away. We were seated where it’s open/front and center. Not much privacy but it was ok. Place not busy. Service was excellent. Guest ordered something not on the Menu . Chef came out to ask how it was. We had Fun. Restaurant should pay attention to Customers request. Maybe this place needs to Review their Customer Service Standards. I live in Palm Springs and at least once a month we are dining at this restaurant. Little pricey but the portions are huge and we usually sharing different dishes. Their Velvet Shrimp and Chicken, their Cashew chicken is outstanding. I may have ordered the wrong meal, but the fried noodles with shrimp was bland. The scotch and water was served with a lemon twist. Really? We were one of only 4 tables being served between 6-7pm. Also only a few in the bar. This was our second time being there. Last was in 2016. I think the restaurant has gone downhill. Will not be back. The service was exceptional! The waiter was super friendly, and helpful and full of great suggestions! Wish I could remember his name! He was great! My party and I found the food to be delicious. Even some of the old favorites tasted somehow new and delicious. We joined another group of 5 and had a party. Thanks Nick! Our dinner was a birthday celebration and guests arrived at different times. Thus, one couple had been served drinks, but it took a while for the waitress to come back to get the rest of our party. From that point on everything went well. The food was very good, as to be expected some dishes were more outstanding while others were just good. Despite a difficult table in some respects our wait staff were very good in dealing with us. Overall, everything was very good. Attended a Fundraiser at the Patio. We were seated in an obscure part of the patio. Upon arrival, there was no one to great/tend to you. I had to ask a Bartender and the Manger sat me. The table was tight. No real privacy from the next table and there was confusion. They need to REVIEW THEIR CUSTOMER SERVICE STANDARDS. I really am very DISAPPOINTED. Good food, good service, will go again. Everything as expected for dinner. We were on Spring Break and my hubby wanted Wings and it happen to be Wing Wednesday. It was delicious. Third time there this winter season, and finally went early and not on Friday, so the place was rather quiet. Would not recommend going on a Friday night, as the bar scene is very loud. Great service from NIcky--really nice guy! Enjoyed the food, good size servings (we always have enough to take home for a second meal) but it is expensive. Come on, Wangs, drop the price of fried rice!! This was my first time there and I was very disappointed. Both of our starters (egg drop soup and jicama salad) were bland and tasteless. Our entrees were not much better - very heavy and salty. The restaurant was perfect, we had a fantastic meal! Great drinks, great food, great service! We hadn’t been to Wangs in a couple of years and thought we’d try it again. When we arrived for our 8:00 pm reservation, there were lots of loud, drunk guys milling around in the area by the host’s stand - overflow from the bar, we guessed - there was also a dancer from Hunters Bar walking around in his underwear passing out cards for his performance later last night - charming. Everything is very overpriced. We were “ok” with the price when ordering figuring it must be excellent food. When we were eating, we both were like “yea, it’s good...” but, after realized we were both thinking the same thing. “That’s it?” Apitizers we’re very small and very expensive. The mains were a decent size but, lacked flavor. Overall, after all the hype, was left very disappointed. Would not recommend. Super fun on Fridays. Food was great and portions almost too generous. We were lucky enough to dine on a night they had a drag show. It was fun and added to our night. Our waiter was the most wonderful man. He was so sweet and accommodating and made us feel very welcomed. We will be returning every time we come to Palm Springs. Thank you! Food was good. A little pricey for the portions. Overall great experience. Food was delicious but ambiance was just OK.
we thought everything was just average. nothing special. drinks, service, food, ambiance.... so in the end it was a poor value and i would not return. not bad by any means. 3 generations of girls night out! We really enjoyed our dinner tonight. In fact we were dining here at Wangs on Saturday night as well. Tonight was quiet Saturday was full restaurant which makes it louder along with the music in the back of the bar. We dine here every year but this time made it twice, as we love the diversity of the Asian menu, so many delicious choices. We will be back end of February 2020! Food was good but could have been warmer. Service was slow and rarely saw any wait staff. Disappointing this time. Busy for dinner on a Friday evening our reserved table for two (and others waiting) were not available and we had to wait for 15 minutes or more. There were tables for four empty but not offered. TableService was very nice but the sweet and sour chicken was not good and we suffered the next day. Friday night Guy’s party is pretty loud. Our server was excellent. If I remember he said his name was Nicholas but his friends call him Nicky? Something like that. He also gave us excellent entree recommendations. 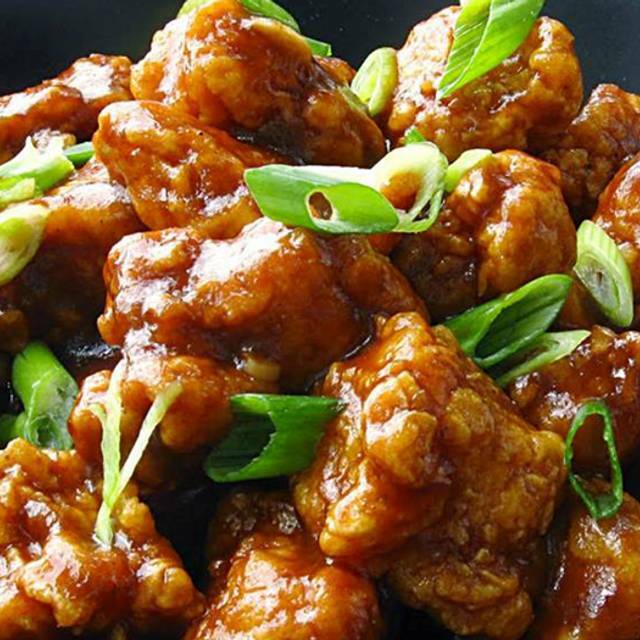 This is Asian food for people who find General Tso’s Chicken at the shopping mall food court too exotic. The wonton soup was salt water with chicken wontons. Everything else was shockingly sweet. Seriously, why was the chicken with cashews sweet? Avoid especially the pad Thai. Maybe if they focused on one Asian country they could get something right, but by playing it safe and trying to be all things to all people they get nothing right. On top of that, service was lackadaisical. I’ll never go back. We weren’t seated until 15 minutes after our reservation. We were told they were short staffed and there were many open tables. After we were finally seated, 30 minutes went by without anyone coming over to our table. The entire section complained about the lack of service, so the manager gave the table next to us a free round of drinks. When we told him we were leaving because we had been there for 45 minutes, his response was “ok”. We had to make a reservation somewhere else.